When it comes to Rosh Hashanah, families of Sephardic and Mizrahi origin — like mine from Calcutta, India — have a secret to share with the rest of the Jewish world: a distinctive New Year’s seder far beyond apples dipped in honey. On the first night of the holiday, we hold a special ceremony at home during which we recite blessings over a variety of foods that symbolize our wishes for the year ahead. The blessings in this ritual all begin with the words yehi ratzon (may it be God’s will), and they all ask for divine gifts of bounty, strength, and peace. The ritual has come to be known as a seder (order) because the blessings are recited in a specific order. Ironically, that order varies according to custom and community. The origins of the ritual date back to the Talmud (Horayot 12a), where Abaye discusses omens that carry significance, and suggests that at the beginning of each new year, people should make a habit of eating the following foods that grow in profusion and so symbolize prosperity: pumpkin, a bean-like vegetable called rubia, leeks, beets, and dates. Click here for recipes and more details about foods used in the seder. It is difficult to trace how the ceremony evolved from that talmudic mention to its current form. According to cookbook author Gilda Angel (Sephardic Holiday Cooking), “It is told that when the Babylonian scholar Hai Gaon (939-1039) left the synagogue on Rosh Hashanah, his students would bring him a basket filled with different fruits over which he recited various blessings and biblical verses.” The Baghdadi rabbi Hakham Yosef Hayyim (1832-1909) mentions the ceremony in his compilation of Jewish law and practice. Like the Passover seder, where foods like bitter herbs and matzah symbolize suffering and freedom, at the Rosh Hashanah seder the foods we eat also become vessels for meaning. Each food symbolizes a good wish for the coming year, and before each food is consumed there is a special blessing to recite, many of which result from puns on the food’s Hebrew or Aramaic name. With each blessing, the mundane aspect of food is garnished with a sense of holiness, poignancy, and even humor. Like other Sephardic and Middle Eastern Jews, my shopping list for Rosh Hashanah resembles Abaye’s list in the Talmud, with a few added features: fat, juicy, red-skinned pomegranates; glossy, sticky-sweet dates; savory pumpkin; pungent leeks; scallions or chives; foot-long green beans (available in Indian shops); deep-green spinach; and crisp apples. Some families use beet leaves instead of spinach, quince instead of apples, and other varieties of beans and gourds. To prepare these foods to be both beautiful and tasty, dates can be split, stuffed with walnut halves, and arranged in concentric ovals. Apples are traditionally quartered and cooked into spicy pink preserves while retaining their shape, with a drop of red food coloring and whole cloves. Though some families prepare more lavish dishes, I like to keep the foods as close to their fresh goodness as possible. I serve the beans and spinach steamed, the scallions or chives raw, the pomegranate separated into seeds for easy eating, and the pumpkin cooked and mashed with a touch of sugar, spice, and soy milk. We begin the seder with a series of biblical verses invoking physical and spiritual blessings. They are repeated a prescribed number of times for mystical reasons. The verses are followed by a piyyut, a religious poem, written by Abraham Hazzan Girondi in 13th-century Spain. Each verse of the poem has a chorus that declares, Tikhleh shanah ve-killeloteha! Let the year end with all its curses! The last line reflects a change in tone: Tahel shanah u-virkhoteha! Let the new year begin with all its blessings! 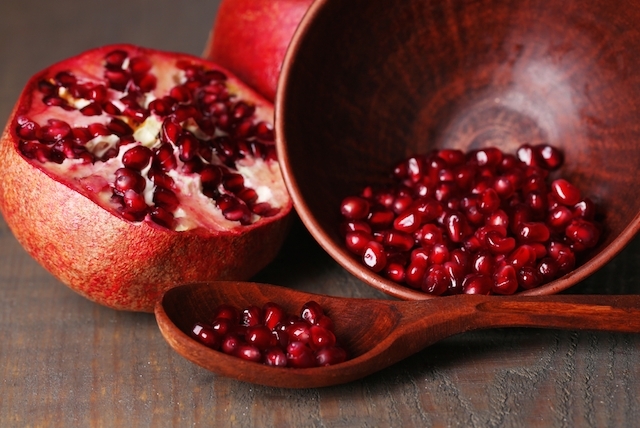 Before eating pomegranate: May we be as full of mitzvot as the pomegranate is full of seeds. Before eating apple: May it be Your will, God, to renew for us a good and sweet year. Before eating string beans (rubia): May it be Your will, God, that our merits increase. (Rubia resembles the word for increase, yirbu.) Instead of string beans, Jews from Libya mix sugar and sesame seeds to symbolize plenty, because the grains are so tiny and numerous that they can’t be counted. Before eating spinach or beet leaves (selek): May it be Your will, God, that all the enemies who might beat us will retreat, and we will beat a path to freedom (Selek resembles the word for retreat, yistalku). Before eating leeks, chives, or scallions (karti): May it be Your will, God, that our enemies be cut off. (Karti resembles yikartu, the word for “cut off.”) Jews from Persia tear the scallions and throw them behind their backs and over their shoulders. Sometimes they then say the actual names of the enemies they want to destroy. The seder originally called for a fish or sheep’s head to symbolize our wish to be heads, not tails; leaders, not stragglers. The sheep’s head (the brains were removed and cooked) also served as a reminder of the ram that saved Isaac’s life; we recite the story of the binding of Isaac on the second day of Rosh Hashanah. Baghdadi Jews discontinued using the fish because its Hebrew name, dag, sounds like the Hebrew word for worry, d’agah. In lieu of the sheep’s head, families that wish to reintroduce a wish for strong leadership might consider a head of lettuce as a vegetarian option. While the blessings promulgating harm to enemies might be troubling today, they were originally created in times of external threat to many Jewish communities, and they embodied faith in a protective God. For families who do not wish to recite these blessings, they can be adapted to reflect positive wishes like friendship and harmony. For instance, the wish for karti (scallions, chives, or leeks) might be, she-yikaret me-aleinu kol ra ve-nitbarekh b’shalom — that all evil should be cut off from us and we should be blessed with peace. Participants can suggest concrete steps towards achieving these goals: thanking a teacher or co-worker, honoring parents, paying a shiva call, or respecting the environment. The seder ends as the yehi ratzon blessings segue right into the Hamotzi, probably the most common blessing over food — yet extraordinary in its acknowledgment of God as the source of all food. The wish for God’s good will and favor, ratzon, extends into at least one Sephardic High Holiday piyyut by Judah Samuel Abbas (13th-century Spain) called Et Sha’arei Ratzon (Gates of Favor). Listen to Et Sha’arei Ratzon here. This long and heart-wrenching poem about the binding of Isaac visualizes the inner and outward journeys of father and son, complete with dialogue and piteous imaginings of Sarah’s reaction. Chanted before the blowing of the shofar on Rosh Hashanah mornings, it ends with a hope for salvation for all. The word ratzon, shared by both the seder wishes and this piyyut, reflects our tender and vulnerable state during the High Holiday season, when we open our hearts to the expression of our deepest fears and desires. Tahel shanah u’virkhoteha! Let the new year begin with all its blessings.